BRICS is an atypical multilateral entity, perhaps the only one of its kind in the world. Unlike regional multilateral organizations, it comprises of five nations across continents. Put together, BRICS countries are more than forty percent of the world’s population. Since 2009 when BRICS was formed, nine summit meetings have been held. 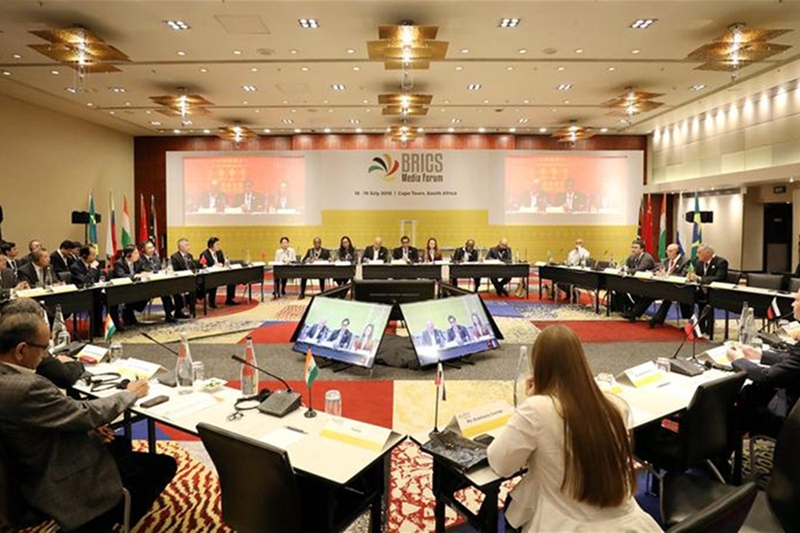 South Africa is holding the 10th BRICS summit when once again the leaders of the five countries would deliberate upon a variety of issues of importance which are common to the member countries. Despite being located in different geographical regions, BRICS members have many commonalities. As is well-known, BRICS cooperation has two pillars: One is consultation among top leaders of the member states. Apart from the annual summits, ministers and senior officials meet periodically to discuss matters pertaining to finance, trade, health, education, agriculture, etc. This gives them an opportunity to frame general guidelines regarding cooperation in all these areas which are crucial to the development of these countries. The second pillar is practical cooperation through working groups. Here concrete steps are taken to implement the guidelines adopted at the ministerial-level meetings. The nine previous BRICS summits have enhanced mutual understanding and cooperation among the member nations. However, the current summit is taking place when the world economic order is confronted with the destabilizing policies of U.S. President Donald Trump. Trade and inter-state commerce are the basis of growth and development the world over but Trump’s “America First” policy runs counter to the process of globalization. Western analysts have by and large been critical of BRICS highlighting the differences and disagreements among them but with the emergence of the Trump phenomenon that threatens the world economic order, it is all the more important that emerging economies come together and plan a strategy which can stand up to the American threat. BRICS, therefore, is a step to build a multi-polar world order and an effort to reduce U.S. geopolitical supremacy. President Trump’s actions taken recently fully justify the emergence, continuation and development of BRICS. As Chinese President Xi Jinping said, “BRICS is the defender and promoter of developing countries and a force for world peace”. The globalized world needs BRICS – now much more than any time before. Creation of the BRICS Bank, now called the New Development Bank, has been a major achievement of the BRICS grouping. The Bank, to quote its senior official, has its “focus on sustainable development and sustainable infrastructure.” In addition, the BRICS Business Council and BRICS Network University are the other two important entities set up by the BRICS nations. With every BRICS summit these institutions are expected to be strengthened. At this BRICS summit with the shadow of U.S. trade protectionism looming large, this matter certainly needs to be discussed. Among the BRICS countries there is a consensus to uphold multilateralism, free trade and an open world economy. Presenting themselves as the voice of emerging nations, the leaders are expected to expand their deliberations on terrorism, renewable and clean energy, food security and civil aviation, among others. Many other major global issues are also likely to be taken up by the BRICS heads of government. Related to this BRICS summit a rather important event took place in Cape Town recently and this was the BRICS Media Forum under the theme of “BRICS Media Cooperation: Fostering an Inclusive, Just World Order.” The media in all of the five BRICS nations have a responsibility to project BRICS as a viable entity which has the capacity to sow the seeds of a new world order. Moreover, each of the BRICS countries has scanty knowledge of each other. Here the media needs to come in and show the real, positive image of each other. Heads of government are expected to create conditions for their media organizations to project BRICS member nations sufficiently and adequately in their own countries. As always happens on the side-lines of the summits, perhaps some bilateral issues may also be taken up by leaders. President Xi and Prime Minister Modi who met in Wuhan in April and in Qingdao for the SCO summit in June are likely to carry on discussing important bilateral issues. The author is vice-chairperson of the Institute of Chinese Studies, New Delhi.